NO PROBLEM : Amateur beekeepers say the county is overly cautious about their hobby, which they contend presents no health hazard but benefits to agriculture. Bees go where they will, unconstrained by such imaginary boundaries as roads or county lines. Beekeepers, however, face bans that prevent them from keeping hives on unincorporated land in San Luis Obispo County. But, like the industrious insects, they’re hoping strength in numbers and creating enough buzz will reverse a county code that prevents them from pursuing their hobby. Under county code, beehives are not allowed closer than 200 feet to a public road unless they are being used for agricultural pollination, which is interpreted to mean commercial farming operations. A violation of the code can, in the worst cases, be a misdemeanor, punishable by a $1,000 fine or up to six months in jail. Members of the Santa Maria Beekeeping Association and fellow beekeepers in the county have asked the San Luis Obispo Department of Agriculture to loosen the regulations. Association members met with the Department of Agriculture officials on June 24. The group proposed to reduce the 200-foot setback to 25 or 50 feet and to reinterpret the word “crop,” which has historically been strictly commercial. “We are establishing a groundwork to possibly alter the county’s regulations, and agreeing to agree,” Threlkeld said. The City of Morro Bay does not prohibit hobbyists from keeping bees in the city. San Francisco allows beekeeping within city limits, and there are many successful rooftop colonies in New York. Why doesn’t SLO County allow hobbyists to keep hives? According to Deputy Agriculture Commissioner Richard Little, his department receives about a dozen bee-related complaints every year. He said there are risks when beekeepers fail to provide water for their bees, causing them to swarm in search of it on their own. Little explained that unregulated beekeeping opens the door to problems for which the Department of Agriculture is liable. 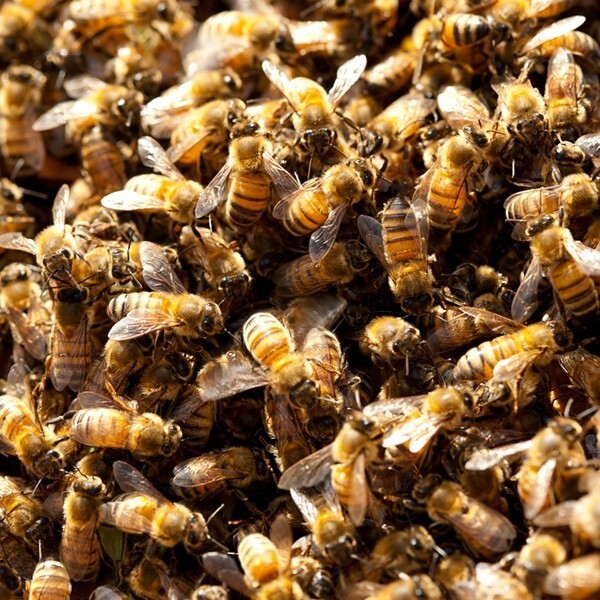 Bee swarms potentially endanger children and people allergic to stings. Honeybees rarely present serious threats, however, even when they swarm, Little explained, because usually the bees aren’t defending a hive. Swarming is in almost all cases a happy time for bees during which they search for a new place to build a hive. Typically they find a permanent home within 24 to 48 hours without incident. If bees (whether for commercial purposes or otherwise) are determined to be a hazard or nuisance, the Department of Agriculture can be held responsible. County health officers are required to determine whether a complaint warrants a health threat, and if it does, to remove the offending bees. Little said the code has been on the books for almost as long as the county has been a county. Agricultural officials tightened up restrictions recently when the more aggressive Africanized bee appeared in California. Threlkeld and Steve Ames, a former president of the Santa Maria Beekeeping Association, stress the importance of bees in the county and argue that the restrictions actually harm agriculture. According to Threlkeld and Ames, colony collapse—a term coined in 2006 as a result of nationwide disappearances of honeybees and their hives—reduced the county’s bee population 30 percent. In previous years, as much as 90 percent of the population disappeared. Honeybees bred to pollinate mono-crops (a single crop grown every year on the same plot of land) are more sensitive to collapse because of lowered genetic diversity. Backyard beekeeping, on the other hand, maintains the genetic diversity of the species, which is essential to the survival of the European honeybee. Threlkeld and members of the Santa Maria Beekeeping Association are collecting information on other municipalities to compare how SLO County’s bee ordinance stacks up. The association contends two or three backyard hives would be no cause for county concern. “We are educating the agriculture department on beekeeping and making recommendations,” he said. It’s too early to predict how much impact the Beekeeping Association will have on the ordinance, or whether they’ll have any impact at all. “Our bottom line is to see if we can accommodate the request that we’ve gotten for the backyard beekeeping and to preserve public safety,” said Chief Deputy Ag Commissioner Brenda Ouwerkerk. Intern Alycia Kiley can be reached via the editor at econnolly@newtimesslo.com.